May 14, 2014: Soldotna reconfiguration requires Skyview students to determine school of eligibility for sports. Click to learn more. Connect on Facebook with the KPBSD Soldotna 7-12 Grade Schools Reconfiguration page. You will find the most pertinent links, newsletters, and factual information about the Soldotna Schools Reconfiguration. Click this link, or go to Facebook and search for KPBSD Soldotna 7-12 Grade Schools Reconfiguration to connect. The Soldotna area 7-12 grade schools reconfiguration will begin with the new school year on August 19, 2014. On April 1, 2013, the KPBSD Board of Education approved an amended motion to reconfigure Soldotna area high schools into one high school for grades 10-12, to be located at the current Soldotna High School: school board meeting. The Soldotna schools reconfiguration for grades 7-12 will start in August 2014, at the beginning of the school year. Ongoing: staffing, planning and operations activities, course offerings, student scheduling, transition activities, and so forth. 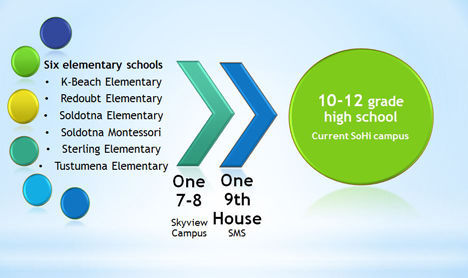 In March of 2012, principals from K-Beach Elementary School; Redoubt Elementary School; Skyview High School; River City Academy; Soldotna Elementary School; Soldotna Montessori Charter School; Soldotna High School; Soldotna Middle School; Sterling Elementary School; and Tustumena Elementary School together with school district administration began meeting to discuss how to best meet the educational needs of students and future students from these ten K-12 KPBSD schools.